Looking for romantic birthday ideas for him? It doesn’t matter whether you’ve been with your man for two months or two years – birthdays are special, and the way you celebrate them can really set the tone of your relationship. Take a little time to get extra creative on this special day, and give him something he’ll never forget. Whether your man is a hopeless romantic, or an always-active guy who loves adventure, we’ve got the answers for you. Read on to find perfect romantic birthday ideas for him. It’s that time of the year again – he turns another year older, and you’re brainstorming romantic birthday ideas for him. Instead of going the usual “watch ‘n wallet” route for gift ideas this year, why not get a little funky? Men are notoriously hard to buy for – forget the jewelry, roses or boxes of chocolate! – so when it comes to picking out their birthday presents, it really is the thought that counts. We put on our thinking caps and came up with 10 romantic birthday ideas for him, so that you don’t have to. They say the way to a mans heart is through his stomach, and if this is true then what better way to tell him you love him, then by whipping up a spread packed with all his favorite dishes? Surprise him with breakfast in bed, or plan a romantic, candlelit meal – either way, put some thought into the dishes and make sure they’re the ones he loves. Sometimes receiving a gift wrapped up and handed to you just isn’t enough – turn his present into an adventure. Design a scavenger hunt that has him running from place to place, and at each spot, leave a small, meaningful gift along with the next clue. To make it extra special, have the hunt lead him all the way back to the bedroom – where you’ll be waiting for him. Celebrate his age in style by creating a book filled with all of the reasons you love him – and make the number of reasons add up to his brand spanking new age. Either go the “do it yourself” scrapbook route, or have it professionally printed. Whatever you choose, these are both wonderfully romantic birthday ideas for him. Remember the days of the good old “mixed tape?” Putting together a tape filled with all your special songs is one of the best ways to show someone you love them. Give it a modern twist by making it an iTunes play list, or keep it classic by getting out the cassettes – either way, he’ll adore it (if you go old school – just make sure he has a cassette player!). Is there something he’s always wanted to do but never had the time, or maybe the money to make a reality? Book it, and do it together! Make his favorite little boy dream come true. Whether it’s hot air ballooning, skydiving, bungee jumping, or horseback riding, a special activity will definitely bring the two of you closer together. After all, jumping out of a plane at 14 000 feet isn’t something you’d do for just anyone (at least I hope not!). Cologne may seem like a fairly standard gift idea, but if you make it personal, it’s anything but ordinary. Buy him a scent that you would love to smell as you grab him tight, and write a note explaining why it makes you think of him. Is it strong and manly? Or, is it light and playful with an undertone of seriousness? Whatever it is, write it down on a card, and he’ll think about why you love him every time he wears it. Engraved cufflinks are a great romantic birthday idea for him if he’s the suave suit-wearing type. Get him a classic, simple pair of cufflinks, and engrave your initials next to his, or the date you met – something small and not too obvious – then he will wear you on his sleeve to work, every day. For the sport fanatic, there really is nothing more romantic then his girl going to the effort of having sports memorabilia signed for him. Buy his teams shirt (or take that one he wears around the house, or when he goes out to lunch with you and your parents…. ), and go to one of the training sessions and ask his favorite players to sign it for him. If you really want to spoil your special guy, why not organize a weekend away, and make it all about him? Start the weekend off with a game of golf, carting or sailing. Go beer tasting in the afternoon before taking him out to a special restaurant that serves up his favorite food, or organize a BBQ in the park (if that’s his thing). Let him know, that whatever he wants to do, you’ll make it happen. Why only give him one present when you can give him a whole weekends worth of presents? Try a few of these ideas on his birthday, or any time you want to make him feel special and loved. Men might not come out and say it – but they love to be spoiled just as much as us ladies!  If you’re out of creative text message ideas then sign up for our free 30 day Texting Club. Have fun! i personally like “get busy together”, but not in the way you describe it 😉 haha. In all reality, great list. I can dig it !